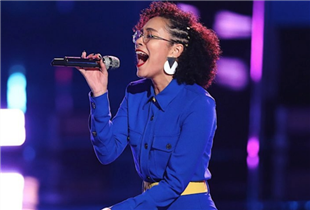 Team John’s Maelyn Jarmon performing “Mad World” (Grade: A) took on Team Adam’s Rod Stokes performing “How Am I Supposed to Live Without You?” (Grade: B) | “Nobody’s gonna beat Maelyn, I’m telling you now,” said John before challenging Adam. And I had to agree with him. She’s my Season 16 frontrunner by a mile. Up first, Maelyn tackled the Tears for Fears ballad that (don’t judge me!) Riverdale made me love all the more. Need I mention that she performed beautifully? She just bends and twists and raises that immaculate voice of hers in ways that make me think she might well come from another planet. We Earthlings don’t deserve her. I felt bad for Rod going up against Maelyn, but he did really well, singing with a kinda Rod Stewart-y rasp and enough forcefulness that he practically didn’t need the mic. I might have faulted him for shouting the classic ballad, but he did it on pitch. And really, could ya blame him for taking his performance to the extreme in hopes of standing a chance against Maelyn? Didn’t think so. Adam tried to make “the story tonight” about Rod, but it seemed to me that that story was destined to come to an end Tuesday. The Voice Recap: Which Contestants Made a Good First Impression in the Last Tuesday Episode for a Month?